Five years ago the western-friendly government of Egyptian President Hosni Mubarak was forced out of power in the so-called Arab spring and taken over within a few months by the Muslim Brotherhood under Mohamed Morsi. After a year and big protests against Morsi in turn, chief of the military Abd Al-Fattah al-Sisi took the country back. Since then al-Sisi has been committed to undoing the harm done to the region by Islamists and resolutely fought terrorist groups - Hamas and ISIS in particular - and has tried to make the country safe for tourists. He has re-established good relations with Israel and has encouraged other Arab countries to join Egypt's 38-year peace treaty with Israel (the only other country which has is Jordan). Most significantly, he has repeatedly called for reforms to Islam - "we need a book that teaches us to love" - and in January last year visited a mass of Coptic Christians (in the picture) and apologized for not rebuilding churches burned by extremists fast enough. 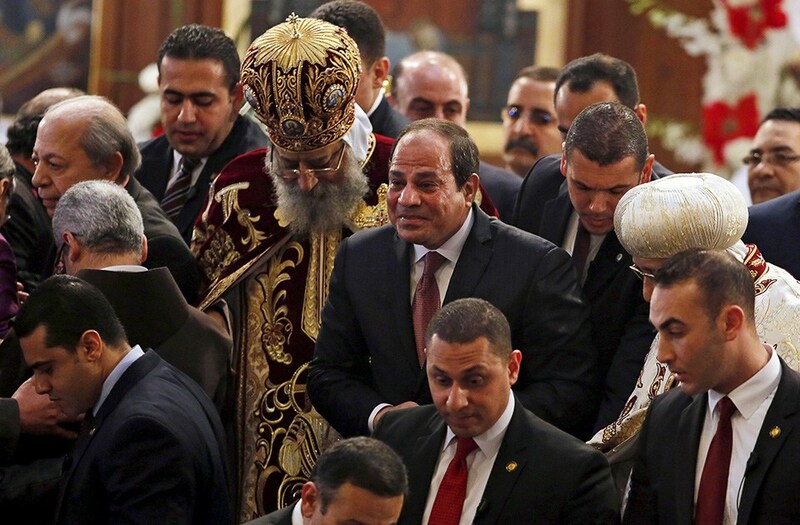 If all the Arab countries had a leader like al-Sisi, there would not be the problems there are now.